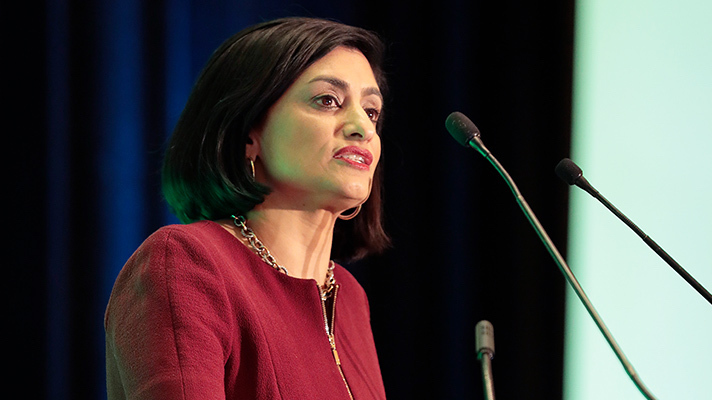 Yesterday at the World Medical Innovation Forum in Boston, Centers for Medicare and Medicaid Services Administrator Seema Verma argued that government can often foil innovation. Verma, a well-documented opponent of single-payer healthcare, has her eyes set on cutting down on paperwork and reevaluating regulations as a means to facilitate technological innovation. Those technological advances are crucial to the future, as the burden of healthcare costs continues to grow, she said. “To give you some context for how we are looking for technology and innovation at CMS, one of the things we think about every single day is the cost of healthcare,” she said. “Our actuaries are telling us that by 2020 we’ll be spending almost 20 percent of every dollar spent in the United States on healthcare, which is simply unsustainable. The solution is not to ration care but to think about ways we can deliver care in a more efficient way that is still providing high value, good quality, but just at a lower cost. It would be hard to discuss the future of healthcare without the term "artificial intelligence" cropping up, and Verma's remarks were no different. Verma pinpointed a number of opportune areas for CMS to implement the technology, including organizing claims data and helping researchers access that data. At the end of March, CMS announced a new contest, called the Artificial Intelligence Health Outcomes Challenge, which aims to speed up the development of new artificial intelligence technologies that can better predict health outcomes and boost quality of care. The initiative is a partnership with the American Academy of Family Physicians and the Laura and John Arnold Foundation and seeks to “unleash” new and innovative tools to help with the push toward value-based care. This wasn't the first AI initiative focused on value-based care; CMS also opened up data to its Medicare Advantage members recently. “Last year we announced for the very first time that we were making data available for our Medicare Advantage members. That has never been done before; that is providing data on 30-something percent of the population," Verma said. In the future, the plan is to make Medicaid data available to researchers. When innovating for CMS, security continues to be a focus. Verma stressed the importance of giving patients access to their own data and creating strict guidelines for researchers using CMS data. But Verma said security is not a static component, rather a fluid part of innovation, which is consistently evolving. While Verma pointed to roadblocks in government and the importance of keeping data secure, she remained optimistic about the future of innovation in healthcare. She ended with a message warning against government control of innovation.